Fox announced on Friday Jussie Smollett was suspended from the hit show “Empire” after the actor was accused of paying two men to attack him last month in what police say was a ploy to raise his profile because he was unhappy with his salary. “The events of the past few weeks have been incredibly emotional for all of us,” said a statement from 20th Century Fox Television attributed to the show’s executive producers. “Jussie has been an important member of our ‘Empire’ family for the past five years and we care about him deeply. While these allegations are very disturbing, we are placing our trust in the legal system as the process plays out. We are also aware of the effects of this process on the cast and crew members who work on our show and to avoid further disruption on set, we have decided to remove the role of Jamal from the final two episodes of the season,” they said, referring to his character, Jamal Lyon, the scion of a recording-industry family. The show is currently in production on the 17th of the fifth season’s 18 episodes, and is expected to complete filming by mid-March. The suspension suggests that scenes in which he’s already appeared will be removed from the finished episode. And plans called for a wedding between Jamal and his boyfriend Kai, played by Toby Onwumere. (Fox would neither confirm nor deny this storyline). The show, still popular among young-adult viewers, is expected to be renewed, and returns to Fox’s lineup on March 13 after a winter break. 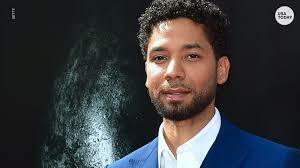 But Smollett’s return to the cast next season is highly uncertain.